Lake Tobesofkee’s most spectacular sunsets. The views from almost every room is AMAZING. Big, bold, stately brick, superior sound construction, so many extras, separate guest apartment garage for up to 4 cars/boat, theatre room, hardwood floors, corian, travertine, porcelain, you name it — top of the line on the lake! THE PERFECT PLACE TO CALL HOME OR WEDDING VENUE!! !Private Country Farm tucked away on 53 acres with Beautiful Lake.boast country living at its best,beautiful scenery,perfect rustic and romantic themed property.This wonderful cypress siding farmhouse with lovely wrap around porch,cozy living area with fireplace, masters suite conveniently located on the main floor,Second floor has two spacious bedrooms with private sitting area,bathroom, additional office space or play area, 36 x 54 Workshop and small pasture. Custom Built by Franco DeMichiel. A newer home in this established water-front community. Unbelievable finishing work inside and outside. One of the most spectacular views of Lake Tobesofkee. Fantastic covered porches overlooking lake. Easy access to boat house and dock with paved driveway from garage to each. Impeccable landscaping. Fourteen foot ceilings on main and 10ft ceilings in basement. Office in basement features a half bath plus recreational room, bedroom, craft room and more. Two Rinnai Tankless Water Heaters. Steam Shower in Master Bathroom. Generator building in to system when power does go out. Three HVAC systems, 3 car garage and more. Dreaming of waterfront property? This affordable 4-bedroom, 3.5-bathroom waterfront home is situated in a family friendly cul-de-sac on a quiet Lake Tobesofkee cove. Bright and open, this lake home boasts a sun room, hardwood floors, and dual staircase as well as granite countertops and a spacious pantry. 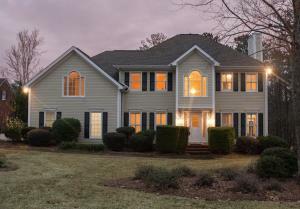 Additionally, this home features a large screened porch and ample outdoor space for entertaining including a boathouse, dock, and waterfront gazebo. Moments from the marina and local shopping, this quiet lake home is sure to please. PRICE REDUCED! 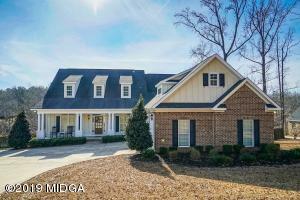 Custom built home on a beautiful 150′ “Big Water” frontage lot on Lake Tobesofkee. 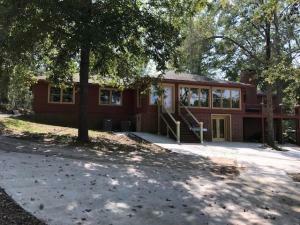 This home features: Breathtaking views; boat house with dock; 5 Bedrm; 4 1/2 Bath; 5th Bedroom could be a Bonus Room; Great Rm with FP; office/study; spacious kitchen with separate dining and breakfast area; open floor plan; finished basement (Mother n Law Suite with walk out) with living room, bedroom, kitchen and full bath ; Screened porch and deck with lake view.. LAKE LIVING AT ITS BEST!!! 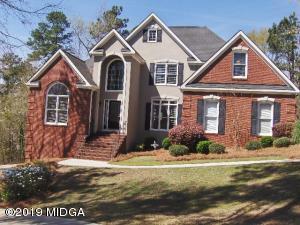 Lake living at it’s best in this stunning 2 story brick home on 1.59 acre lake front lot. 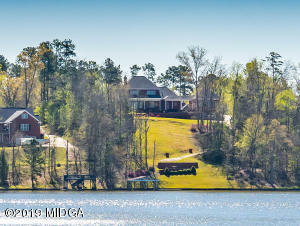 Private gated home with incredible views of the lake – dock, boathouse, salt water pool, screened porch, back deck. Formal dining room, great room with built in shelves, fireplace, granite counters in kitchen, walk in pantry. 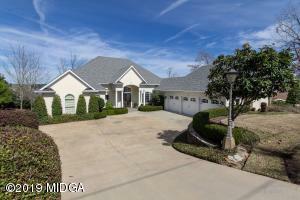 Master on main level with spa like bath, walk in closets. 3 more bedrooms upstairs share jack and jill bath. 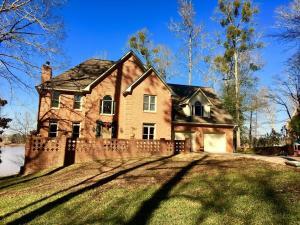 Walk out basement has 5th bedroom, tiled bath, media room, storm room, 2nd garage area. Furniture included with full price offer!